Dog and cat lovers would agree that getting your pet to the grooming salon is a task. Not only does it take time, but the new sights, sounds, and smells can be overwhelming for your pooch. As with most humans, dogs also have distinctive personalities that shine through at the oddest of times. One of these instances is when they tend to show extreme indifference towards getting their nails trimmed. Even attempting to cut your pets’ nails can be a herculean task that ends in a lot of howling. While most dogs get annoyed at grooming centers, some are too docile. It is, therefore, ideal to create a safe grooming environment at home for your pets. 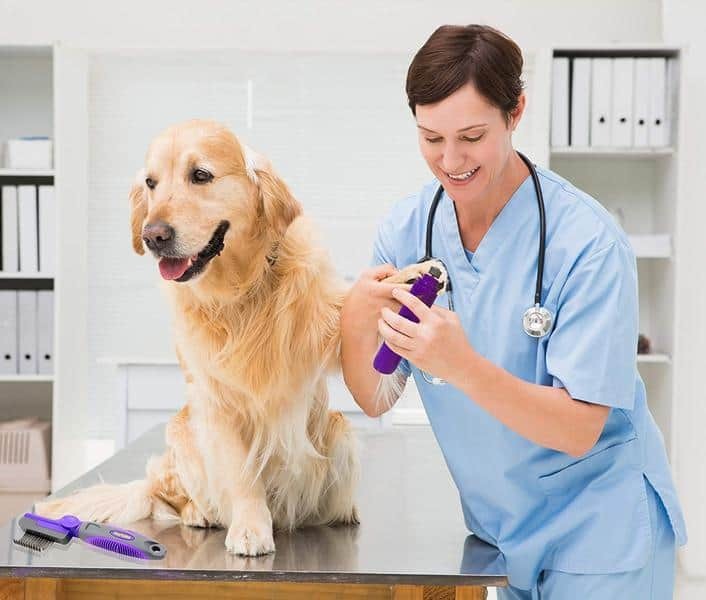 Paw care is always an essential part of pet hygiene and using a pair of good nail clippers and grinders is an excellent way to maintain good health. Dogs of different breeds and sizes require various grooming tools including nail clippers. Three main types of clippers are widely used for pet grooming. Guillotine Clippers – These clippers have a sharp retractable blade with a squeezable handle and is ideal for small to medium sized dogs. The edges act as a guillotine and help slice off the nail. However, remember to snip perpendicular since cutting the nails sideways can crush the nail. 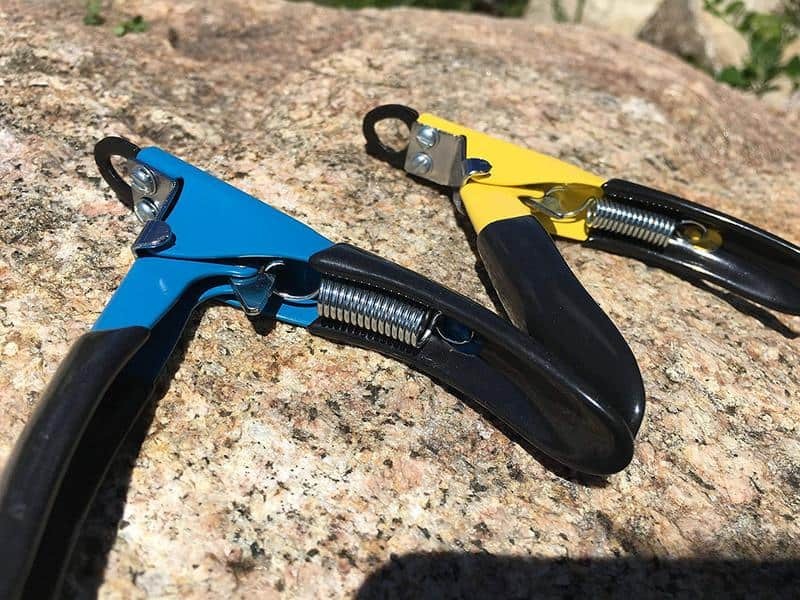 Scissor Clippers – As the name suggests scissor clippers are designed like scissors to help cut the nails of medium to large sized dogs. 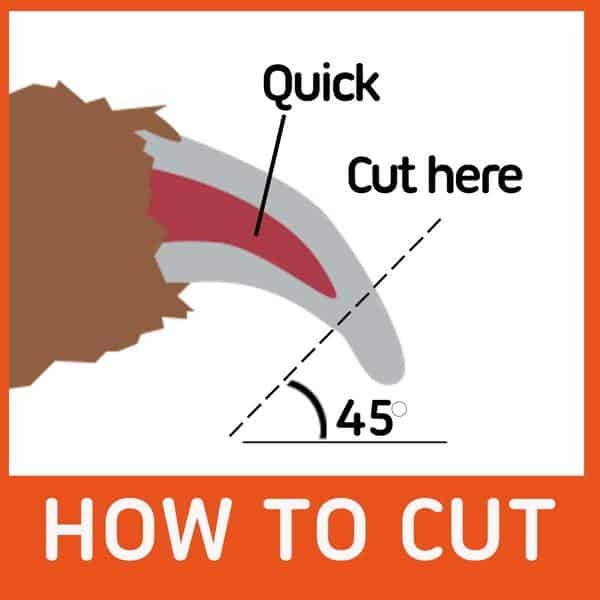 Most scissor clippers have a safety guard or quick guard in place to prevent excessive cutting of the nail. Grinders or Rotary Sanders – Sanders or grinders work by grinding the nail down rather than snipping or cutting it off. This is very helpful for large dogs with hard and thick nails. However, use caution since the sound and feeling of the sanding might be irritating to most dogs. The clippers in this review are tested by our enthusiasts on their own pooches, and we made sure no one (human or dog) was hurt during this process. The nail clippers and grinders in this list are arranged in ascending order according to price with comparisons for quality and comfort. Once you get the hang of it, remember to be patient with your pup and offer treats and toys to keep them on their best behavior. 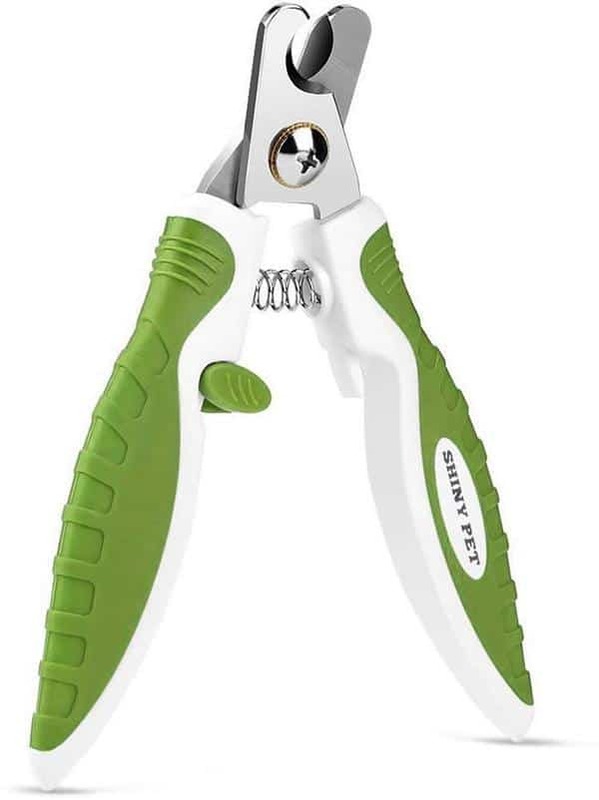 Safari scissor-style professional nail clippers for dogs is a popular choice amongst pet owners. With stainless steel blades and a textured rubberized grip, this inexpensive nail clipper is a boon for people with medium to large-sized dogs. 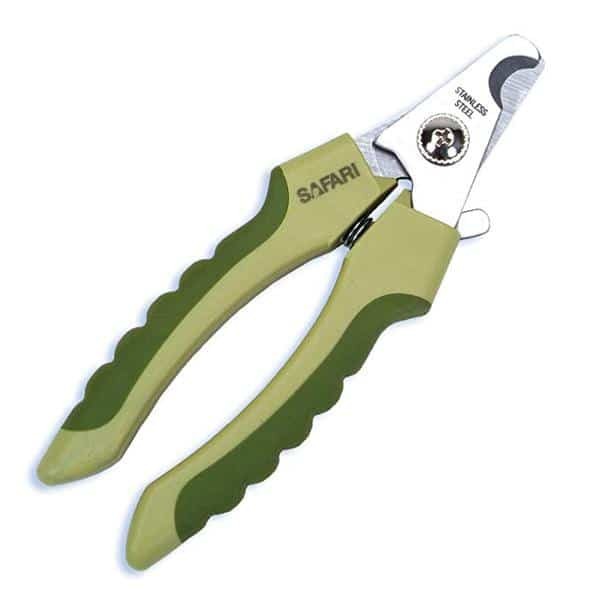 This nail trimmer from Safari also comes with a safety guard that helps you stop over-trimming your pets’ nails. This safety feature was designed keeping in mind the over-enthusiasm of pet owners and disinterest in dogs. This traditional dog nail clipper from Safari was designed for simplicity and ease of use. The blades remain sharp for extended periods of time and don’t go dull very quickly. They also help snip hard and thick toenails with precision. The rubber coated handle grips are pressure controlled by the spring in the grip and are comfortable to hold. Another plus point to these clippers from Safari is that they can be locked with a locking mechanism to prevent mishaps. Another scissor-styled clipper makes our list. 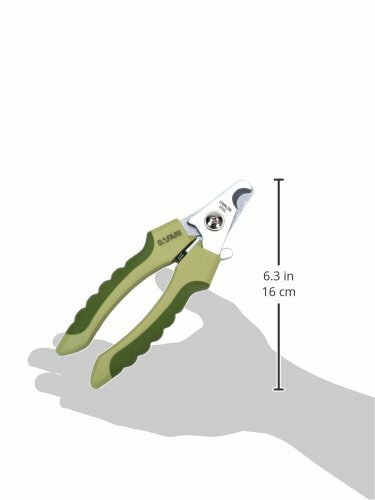 The second in our lineup, Epica boasts of super-sharp nail clippers in stainless steel for painless snipping of toenails. 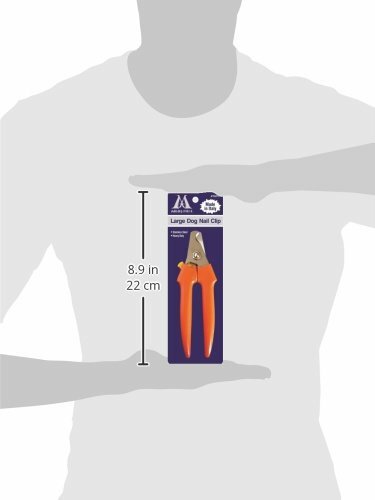 These nail clippers are highly efficient and make clean cuts without minimum to no pain. Since the blades are sharp and cut cleanly, most pet owners have not felt the need to file their pets’ nails after cutting. Many times, rough edges need to be filed for safety. The Epica Professional comes with ergonomic rubber-coated handles that are shaped to handle with ease and comfort. They also have the added advantage of being anti-slip to prevent accidents. With an attached quick guard, you can trim your dog’s nails easily and with confidence. Epica has come out with these in a range of small – medium and medium-large for all breeds and sizes of dogs. 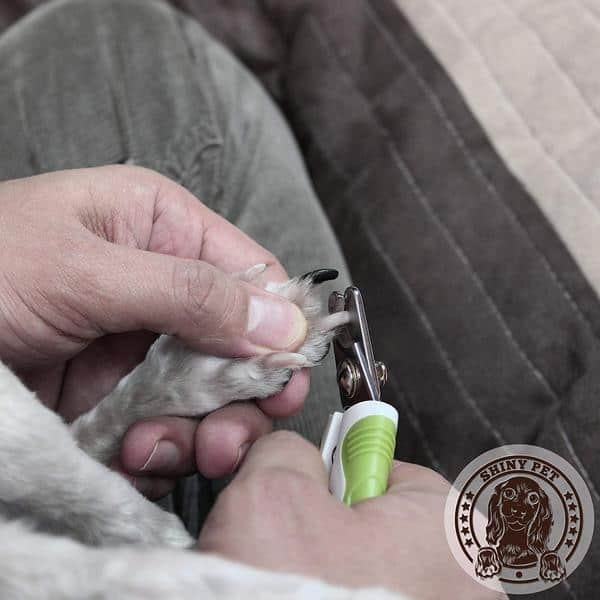 Shiny Pets have come out with a nail clipper variant only for small sized dogs. Apart from dogs, these clippers are versatile enough to be used on rabbits, cats, and birds. 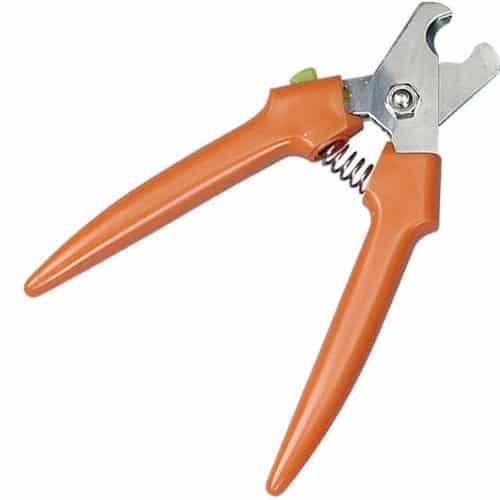 These nail trimmers are easy to use on small dogs and are harmless looking yet smooth and comfortable to hold. 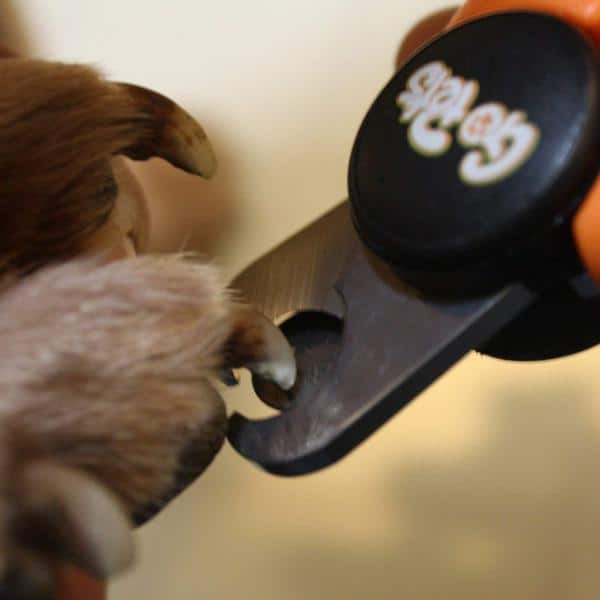 The blades are sharp, fitted, and angled to get a precise cut for your pet’s nails. These enhancements help in quick, accurate, and clean cuts giving an almost painless experience. Reduction in pain minimizes the anxiety and restlessness that pets may feel from the ordeal of getting their nails cut. The handles are made with 100% recycled plastic and like the ones from Epica, also come with anti-slip properties to reduce mishaps. Shiny Pets also offer an unconditional warranty on this product and will happily replace the product if you are unhappy with the results. Millers Forge is one of the better-known names in the world of pet grooming. The nail clipper from Millers Forge is a handy and durable tool. 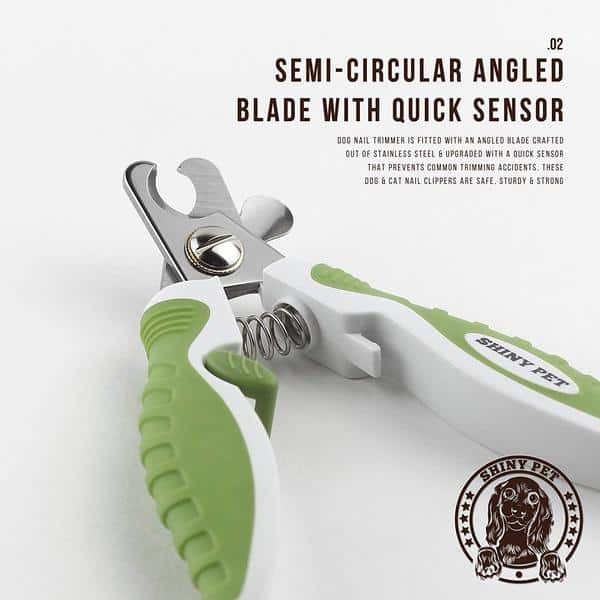 With an added spring for resistance and German stainless steel super-sharp blades, these clippers work excellently even on the toughest and thickest of dog nails. They cut quickly and cleanly for a hassle-free and stress-free nail clipping experience. With a simple design, the efficiency of the Millers Forge nail clipper is uncompromised. 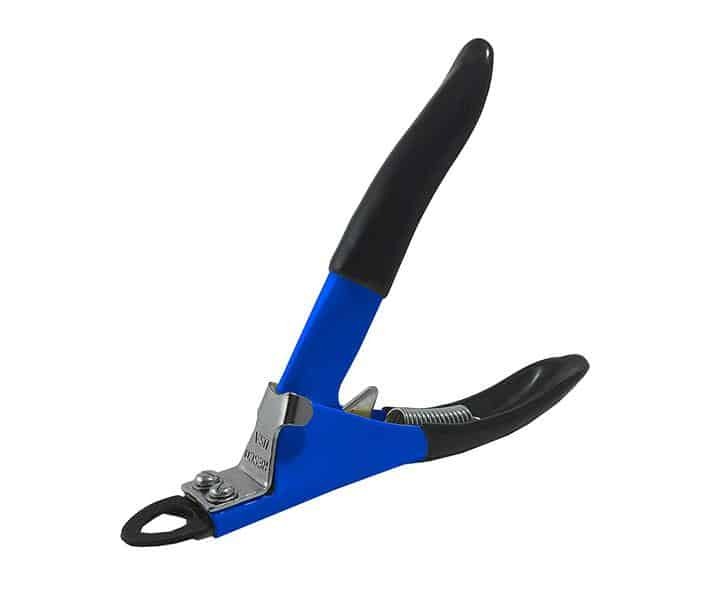 Reasonably priced and affordable for most pet owners, the nail clippers from Millers Forge are sturdy and long lasting. Scissor-style, these clippers work well on medium to large sized dogs and even on several super-large dogs like Great Danes and Mastiffs. This is basically a fantastic pair of clippers for dogs weighing over 40 pounds. 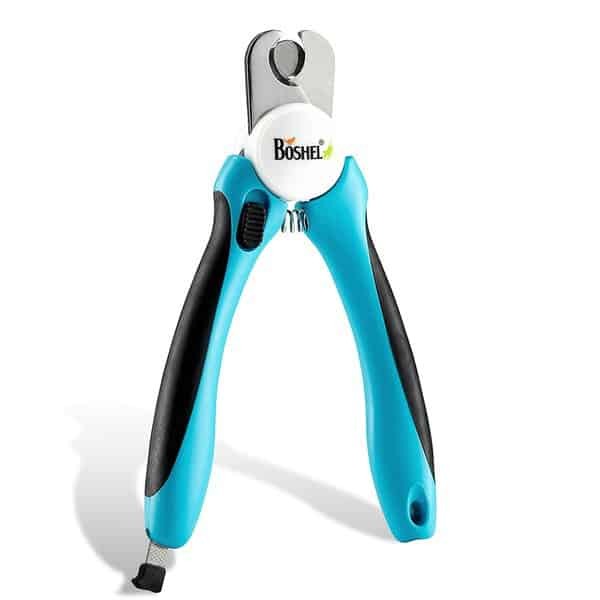 The nail clippers from Boshel are ergonomically designed to sit comfortably in your hand. Made out of 3.5mm thick stainless-steel sharp blades, these nail clippers from Boshel assist in snipping nails with just one cut. Boshel also believes that their nail clippers stay sharp for several years. While it is not possible for us to test this immediately, we put faith in countless user reviews over the years. The nail cutting experience is a stress-free, painless, anxiety-free event for gods and cats alike. The handles have a good grip and feel firm in hand. They don’t slip easily and come equipped with non-slip technology. This additional safety feature helps in curbing accidents and mishaps due to unruly pets. 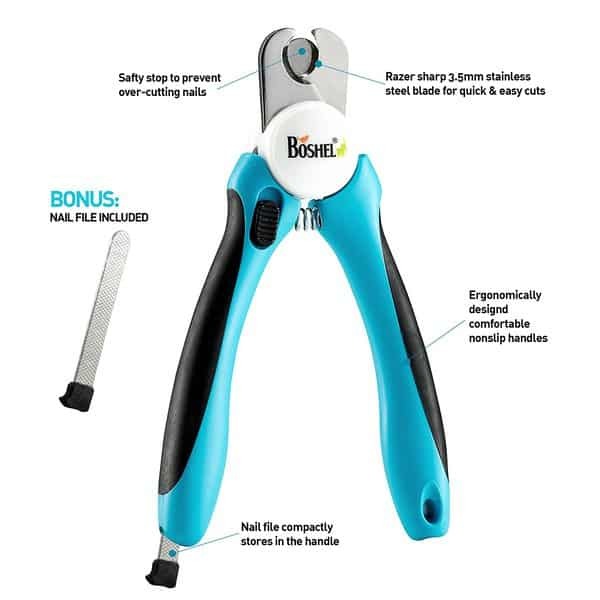 These nail clippers from Boshel also have a safety guard that stops the nails from getting cut too close, thereby preventing injuries to your dog. Safely used on medium to large sized dogs, an additional bonus with this clipper is the mini file included to help blunt the nails of your dog. Resco is known as one of the pioneers in dog grooming and started the guillotine style clippers as early as 1937. These clippers are also the only guillotine-style clippers on our list. Resco uses clinical grade American steel blades to maintain the purity and hygiene of their product. They slice cleanly through the nails and cause minimum discomfort. Resco also has a micro-honed specially engineered blade system that helps cut the nails quickly and efficiently. As an added feather to their cap, Resco has a blade replacement technology that allows you to quickly get strong, sharp blades instead of buying a new set of nail clippers every time. 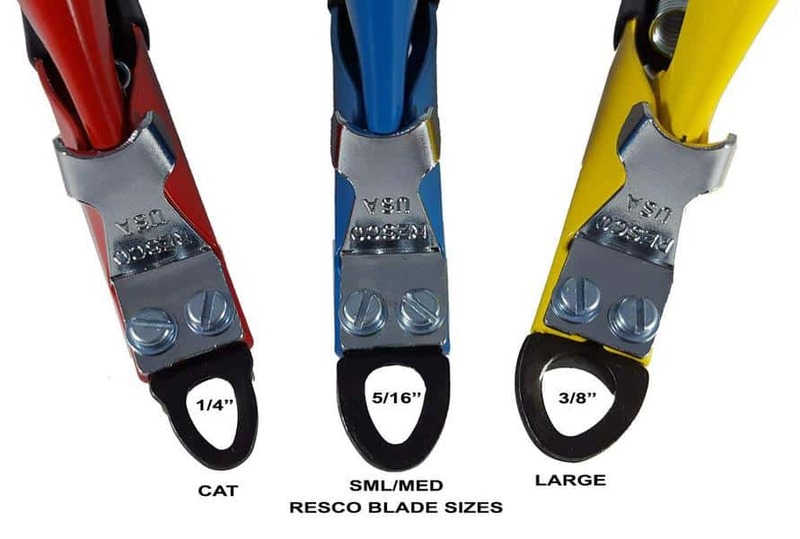 These nail clippers from Resco also come in different sizes based on dog breeds. The small-regular sized guillotine clippers are excellent for dogs up to 50 lbs., and large-sized are perfect for dogs weighing 50 lbs. and above. GoPets is a well-known name in the pet grooming market. 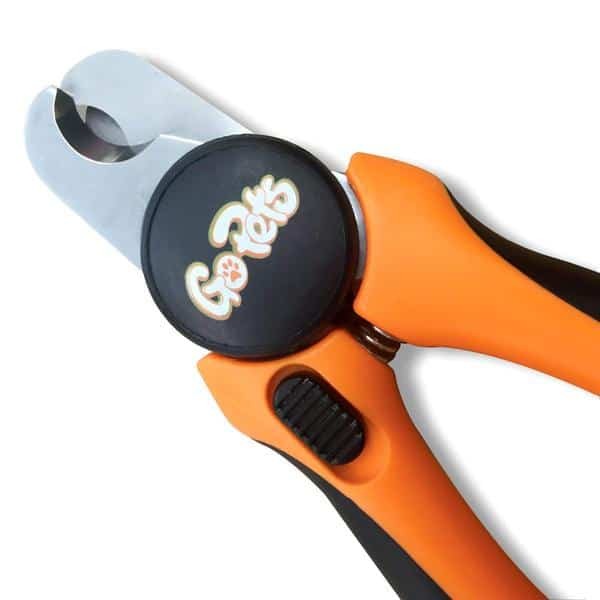 With a range of animal grooming products, GoPets have an excellent set of professional dog nail clippers. This set has a built-in quick sensor that acts as a safety feature to prevent over-cutting of your dog’s nails. This feature saves them a host of pain, bleeding, and trips to the vet. Like the Resco guillotine clipper, these scissor-styled clippers also come in a variety of sized based on the size and needs of your dog. High in quality, the GoPets blades are 3.5mm stainless steel and make clean and painless cuts. GoPets is also known for their long-lasting blade sharpness. The grip on the clippers is firm with anti-slip properties to prevent unnecessary accidents from taking place. Large handles help in getting a good hold over the Clippers to use them as necessary. GoPets also donates a part of their profits to animal charities. 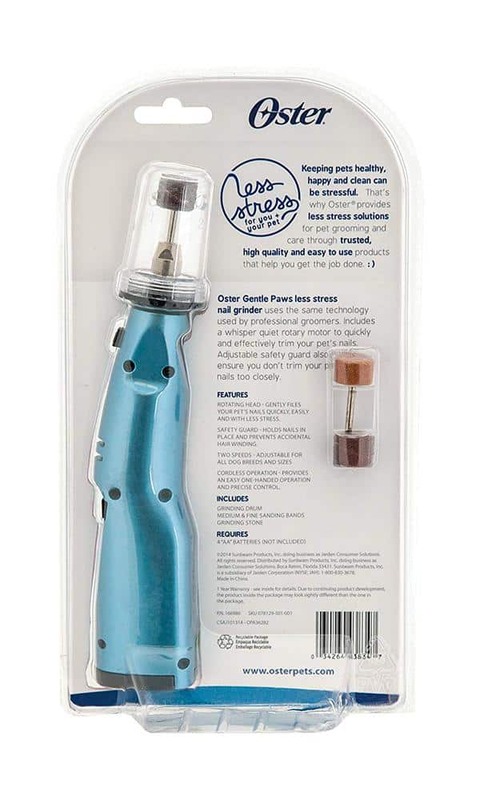 The first nail grinder on our list, the gentle paws from Oster is known to be a noiseless one with a quiet motor. 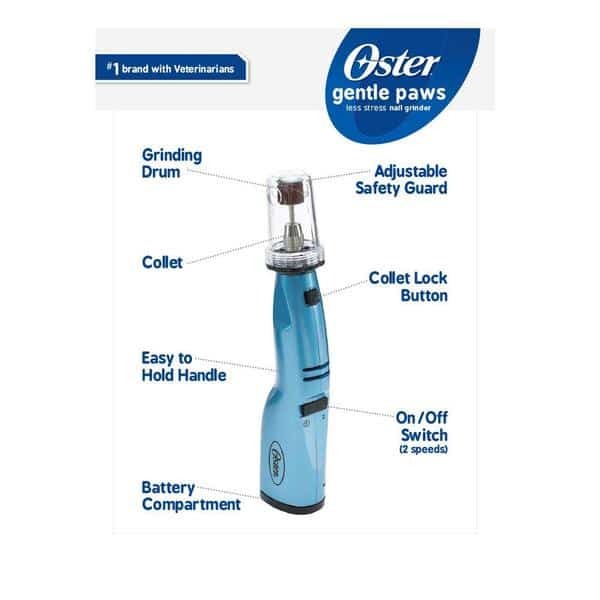 Great for dogs who get anxious during grooming sessions, the Oster Nail grinder helps make the experience an enjoyable one. 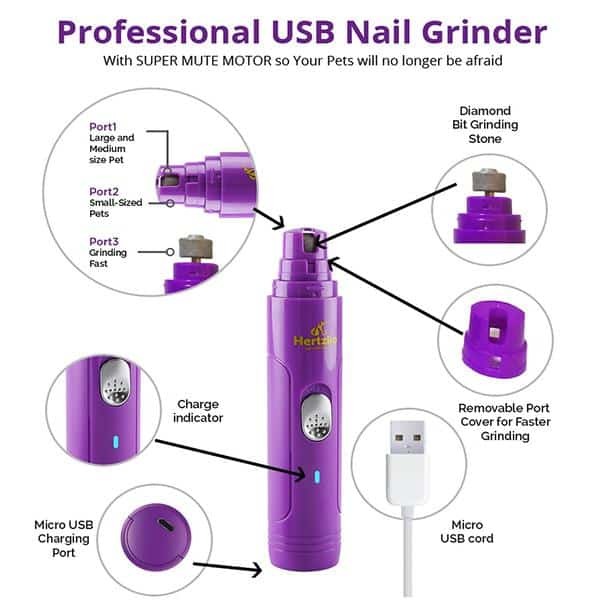 This nail grinder is also good for dogs that are sensitive to loud sounds and have had lousy nail cutting memories. Ergonomic to hold, Oster has ensured that pet owners are equally happy with the curve and hold of the grinder. Another added feature is a safety guard that helps prevent excess damage to your pets’ paws and keeps the dust from spreading too widely. A plus point for many pet owners is the affordable price for this grinder. Hertzko is another well-known and well-trusted pet grooming brand. 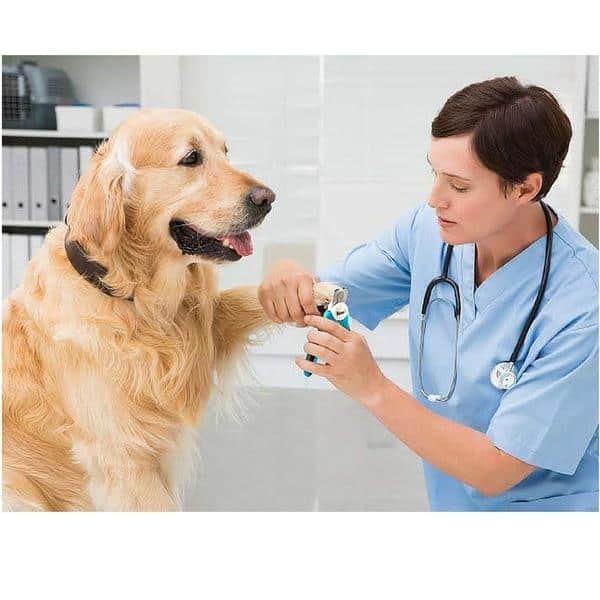 They provide tools for dogs, cats, and other animal species too. This product from Hertzko offers a substantial amount of energy and RPM resulting in excellent results for all sizes and breeds of dogs. With a portable USB charging device, the usability of this grinder is unparalleled. 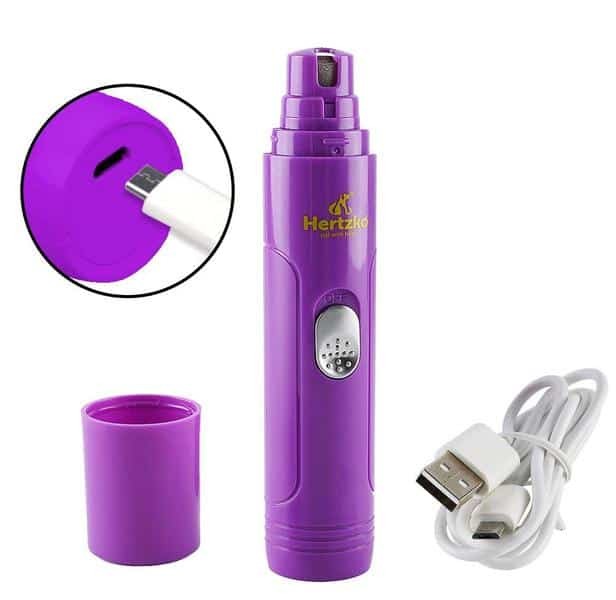 Another unique feature that Hertzko mastered with this nail trimmer is the low sound emission and low motor sound. Many pet owners have described this feature as being one of the most important to control over enthusiastic as well as sound-sensitive dogs. Equipped with multiple heads, owners of numerous dog breeds can comfortably change the motorheads and use the Hertzko trimmer for all their pets. 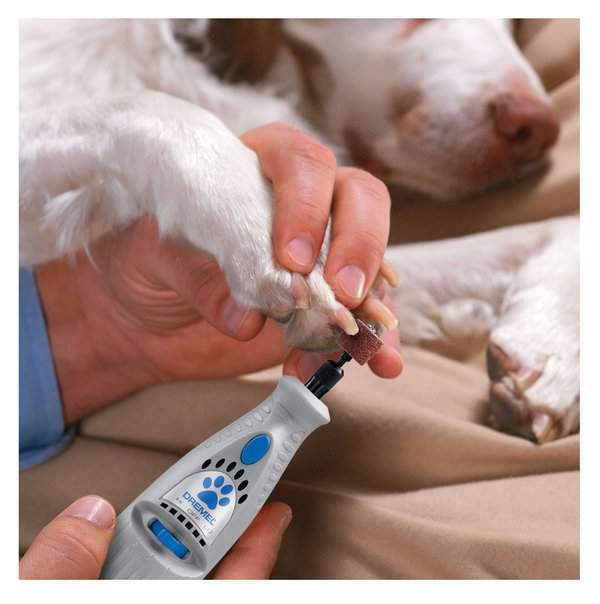 The device also comes with finger grips to allow better grip with flexibility while trimming pets’ nails. The last yet not the least tool on our list, the Dremel is one of the best dog grooming products we have tried so far. Set with two speeds, the elegance of the grinder is excellent for the patience of your pet. The spinning motion of the grinder helps calm pets down and offers a quick and painless solution to anxiety-prone dogs. 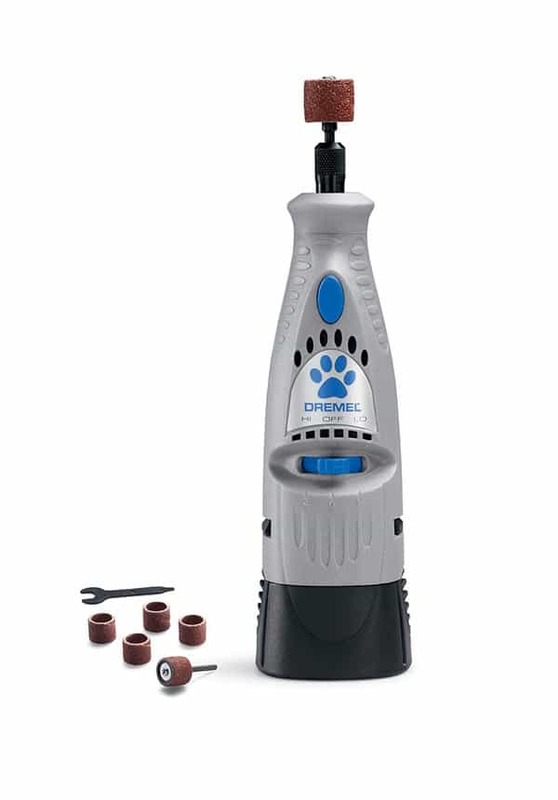 Cordless, the Dremel Pet Grooming grinder is an excellent alternative for large dogs who run around or for pets that do not like to sit still. 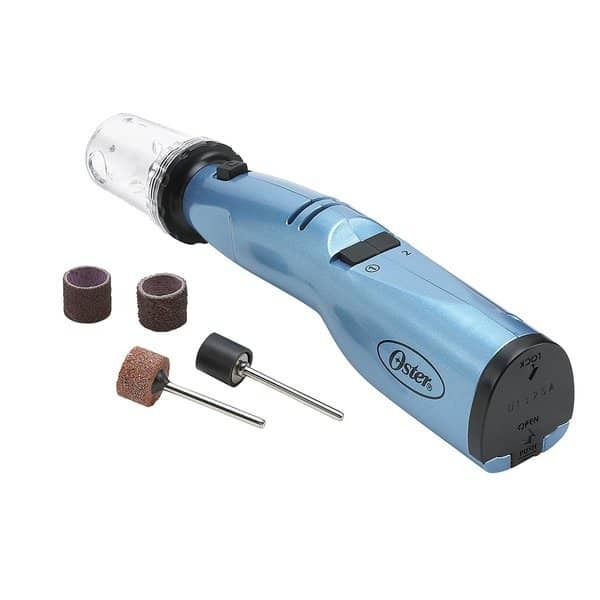 The battery life of the Dremel Pet Grooming Tool is exceptional and takes approximately 3 hours to charge fully. Apart from this, as an added advantage, Dremel has included an LED light to indicate charging and levels. It also comes with a 2-year warranty from the manufacturer.